After delivering petitions to Governor Bruce Rauner’s Chicago office with limited entry, cooks and cashiers in the Fight for $15 occupied the lobby of the Thompson Center to protest Rauner’s veto of a $15/hour minimum wage just moments ago. In response, over a dozen workers sat together on the floor of the Thompson Center lobby, while chanting, “Rauner Vetoed $15! Veto Rauner in 18.” Workers dropped a massive banner reading, “Rauner Vetoed $15, Veto Rauner 2018.” Billionaire Governor Bruce Rauner just stole food out of my son’s mouth and blocked raises for 1 in 3 working people across Illinois,” said Adriana Alvarez, a McDonald’s worker making $11/hour, who participated in the sit-in. “We’re here to let him know that this isn’t the end, it’s just the start. Our movement has raised wages for 22 million people across the country, and proved that when working people stand together there’s nothing we can’t do. The millions of underpaid workers in this state will remember Rauner taking food off our families’ tables when we go to the polls in 2018. And that’s why on Labor Day, low wage workers across the country are holding politicians like him accountable for failing to raise our standard of living. The corporations these politicians side with are just as guilty. Together, they rig the system against workers like me.” Illinois’ minimum wage is just $8.25, where it has remained for more than a decade. 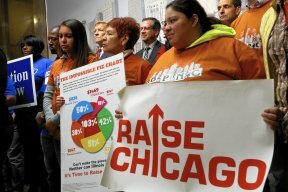 SB-81 would have raised pay for more than two million Illinois workers, including nearly half of the state’s African American and women workers and 60 percent of Latino workers. The bill would have generated $2.3 billion in revenue to alleviate the state budget crisis. Since the launch of the campaign for $15/hour in April, workers, small business owners, and elected leaders have urged Gov. Rauner and state lawmakers to sign SB-81 to give struggling families a lift and boost the economy. 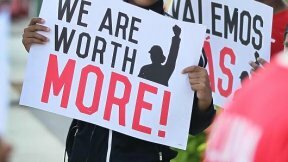 The Fight for $15 has spurred wage hikes totaling more than $62 billion for 22 million underpaid workers, including more than 10 million who are on their way to $15 an hour, by convincing everyone from voters to politicians to corporations to raise pay.